Stems: Erect, simple or branched above, glabrate to villous. Leaves: Basal and cauline, mostly on lower 1/3 of stem, cauline opposite; petiole .4 to 3 inches; blade narrowly ovate to lanceolate, oblanceolate, or linear, 2 to 4.8 inches long, .3 to .8 inch wide, entire or with 1-2 basal lobes, lobes lanceolate to linear. Inflorescences: Heads, solitary; involucres campanulate; peduncles 3.2 to 14 inches. Calyculate bractlets 6-9, ovate to narrowly lanceolate, .16 to .45 inch. Phyllaries in 2 series: outer broadly lanceolate to ovate, .3 to .4 inch; inner ovate to deltate, .3 to .47 inch. 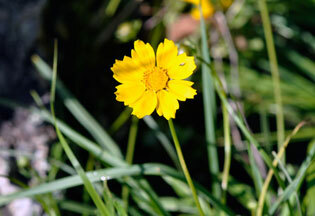 Flowers: Ray florets usually 8: corolla yellow, ligule .6 to 1.2 inch, apex with 3-5 prominent teeth. Disk florets many: corolla yellow, .24 to .3 inch, lobes 5. Fruits: Achenes, black, elliptic or oblong, .1 to .16 inch; pappus of 2 short teeth. Seed 1. Comments: Coreopsis, bug and appearance, alluding to the achenes of some species resembling ticks and lanceolata, spear-shaped, alluding to the leaves.